If, at some point in time, someone were to ask you, “what’s the stupidest thing you’ve ever done in your life”, how would you answer that question? Of the enumerable responses; dating some person, jumping out of a moving vehicle, having that one last drink, trying to outrun bulls – I’m sure that were people to hear that Aaron and I (Oz again) were going to be riding approximately 3500 miles on small displacement scooters in a 10 day rally ride, they’d presume our answers would be swift. Without hesitation. Reflexive, to a tee – doing this ride. I’m sure that’s what people think, judging by my conversations with most people I encounter who know me just well enough for me to admit to this particular task. No, this isn’t stupid. Stupid was that time I had so much to drink I woke up face down on top of my bed with my pajamas and shoes on. Which means that somewhere I had the sense to take my shoes off, get undressed, put my pajamas on, then put my shoes back on, before collapsing. Stupid was that one girl I may have involved myself with while I was in my early 20s, who was in turn involved with a 3rd degree black belt in kenpo. Stupid was that time I was riding mountain bikes in the Oakland hills loops at 10pm at night without a flash light and crashed into a tree. No, this isn’t stupid. This is an adventure. Aaron and I got the bug – no, wait. That’s not right. I got this bug a while ago. You see, this is not the first Cannonball I’ve participated in. 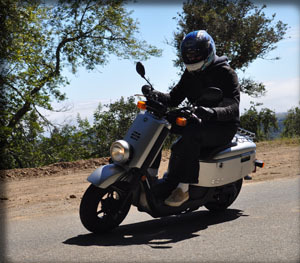 I was a participant in the Scooter Cannonball Run 2008, on a grey Vespa Granturismo 200, and placed 5th in my class. Would have had 4th had it not been for mechanical failure 90 miles from the finish. After that ride, 10 punishing days of the most technical twisties you’ve seen mixed with the most dull corn-laced two-laners you’ve ever beaten your patience with, I wanted nothing to do with it ever again. Nothing, not a thing, it was dead to me. Until someone asked me if I would do it again, at a club meeting, while being interviewed for Urban Moto. I was Pretty Damned Sure it would be a Stupid Thing To Do Again, and could Never Be As Amazing As It Was This Time. Of course, as with all hyperbole with caps, I was quick to doubt. Aaron had been talking for quite some time about riding cross country on scooters, our girlfriends in tow, living via RV. Almost by magic, we divined upon this notion of riding stupidly small bikes across the United States in synchronicity, and Cannonball became the vehicle (ahem) by which this tragic nonsense would occur. We would head out on the highway, looking for adventure (or whatever comes our way). Our hearts, which had at one point been fixated on riding vintage Vespas at our own pace, drifted towards riding 50 cc bikes on a tight time line, something brutal that kept the engine running in ways that it never was meant to. Is it unexpected, or strange that we would pick small vehicles? No. The conversation actually arose as we spoke about the trials and tribulations that occurred in 2008: nearly everybody in the 250 cc class (the one my lowly 200 cc was in) had some form of mechanical failure. A belt snapped here (once to almost tragic results – tossing Joel Hamilton off of his choice modified GTS in the middle of a curve, while past 75 mph), an exhaust stud broke there. Variators chewed through oil pans, spilling sanguine crank case fluid as if the scooter’s very stomach were stabbed and torn with a civil war bayonet: lunge, twist, pull out. These were all expensive machines; Italian and finicky. We decided to test that. Aaron found himself a Yamaha C3. I, a Honda Ruckus. And prep began. We analyzed the bikes for their short comings and put our minds towards plugging those gaps. Range. Top speed. Rideability. Mostly small changes were made; variator modifications, brakes, shocks. A CDI may have been exchanged. Riding range had to be addressed; I added a 3 gallon tank, Aaron went with the tried-and-true gas can. Wheels were purchased. We had intended for more fanfare. More noise, conversation, discourse. This blog, part of it at least, was to catalog our goings on leading up to the ride. Our prep and lives got in the way, though, and prevented anything along those lines. Today, we gave our bikes away to Maroy, a Cannonballer from 2008 who rode an MP3 250 into 3rd place. A consummate rider and excellent individual, he will be riding in 2010 and his parents will be helping with a chase vehicle (which will inevitably pass us each and every day, much to our chagrin). They will haul our bikes to Vancouver, BC, and we will saddle up for a slow, torturous ride to Portland, Maine. We are pretty sure the bikes will make it, though there has been some worse-case-scenario planning involved. We are also pretty sure that as much as any portion of the bike may represent a weak spot, we ourselves are the greatest vulnerability: our fleshy forms will ache and stiffen, our bones will creak and muscles tense. It will get cold, we will get sore, and this will be something I am absolutely certain I will say without a tinge of irony at the end that I Will Never, Ever, Do That Again. Until we find the next way to make this as big of an adventure as possible. Next stop, Vancouver. Wish us luck. Pictures and posts will be made here as regularly as possible. Ride safe, and enjoy the journey!